Green performance may well not mean green roofs are green all the time. And the results of our second green roof poll suggest that most respondents understand this. There is a misconception sometimes that a green roof has to be green all the time. Most landscapes in Northern climes are not permanently green. So why do we expect a green roof to be green all the time? Should a green roof be green all the time? While the question appears to be about colour, it is really about its environmental performance. A green roof might be brown at certain times of the year, but that doesn’t mean it is not delivering on an ecological level. Horticulture might consider that green all year-round is good. However, ecologically, when a green roof is not green it is probably performing as well as it should. In fact, a couple of online articles in the US prompted the second poll. The first, in the Denverite, asks whether the new bylaw, which requires new, large buildings to include green space on their roofs, would attract wildlife. According to the article, Denverites prefer green grass and roses. However, green grass and roses are not indigenous and, as Dr Frank-Thorsten Krell points out, it is roofs with native plants that will help native species. “There are no lawns in Colorado,” says Krell. “Our grass should be yellow most parts of the year, that’s how it is.” But, according to 24% of the people who responded to the poll, yellow grass does not constitute a green roof. Extensive green roof designed for biodiversity London. Should a green roof be green in colour to let nature thrive? Notwithstanding the fact that roofs in Denver might not be green all the time, there is a question of whether ‘critters’ will thrive? Our response is they are more likely to thrive if they are planted with native vegetation. And if they are, then they will not be green all the time. The colour, like landscape at ground level, will change with the seasons. Research here in London and elsewhere in Europe shows that a well-designed native extensive green roof can be a real haven for native fauna. We are sure that this will be the case in Denver too. This brings us to the other online article published in the Chicago Botanic Garden blog. Dr Kelly Ksiazek-Mikenas wants to create native prairies in city skylines. Of course, here at Livingroofs.org we couldn’t agree more. 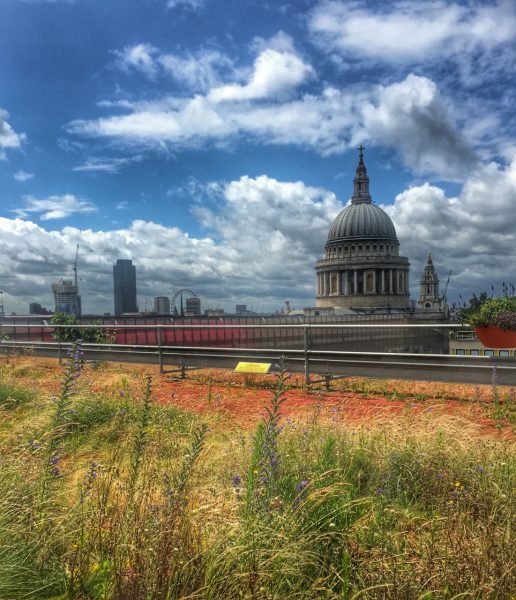 While we wouldn’t call them ‘prairies’, many green roofs in London are essentially dry grasslands. Both prairies and dry grasslands are not green all the time. On visiting Berlin during her research, the lack of plant diversity on the roofs there surprised Kelly. This is because they tend to be based on a sedum approach to green roofs. However, to create the kind of prairie characteristics Kelly was interested in she had to research what plants would work in Michigan. Her research has created a palette of native prairie plants for use on green roofs in the US. This will lead to greater green performance in the ‘skylines’ of our cities. Apart from delivering sustainable nature on green roofs, there is a further issue here. Of course, a green roof can be green all the time. Yet to maintain a green veneer will require input. Namely irrigation and intense maintenance. There is a cost in both financial terms and in the use of resources. In many areas of the world irrigating a green roof will be necessary.Yet by going native irrigation requirements should be less. Creating ‘prairies’ will ensure meaningful nature can reside among the fabric of the city. Here at livingroofs.org we have long advocated this approach. Sadly, professionals still view green roofs like other building products. They need reassurance about how the product will perform over time. There is a focus on weight and aesthetics. Yet, as our first #greenroofpoll suggests, nature is what inspires people about green roofs. 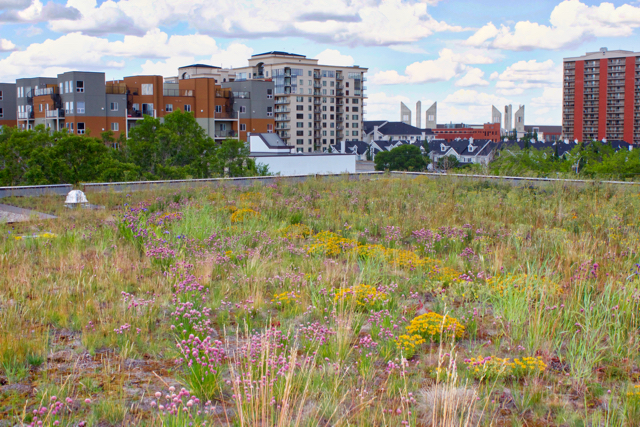 Delivering prairies in the sky can ensure that green roofs are a landscape process. Prairie green roofs will also perform better across the sustainability agenda as well. A win-win for nature, people and cities. If you want to take part in our regular #greenroofpoll the latest one is always pinned to @greenroofsuk ‘s profile on twitter.